Hello Neale and all you wonderful people in WetWebMedia! 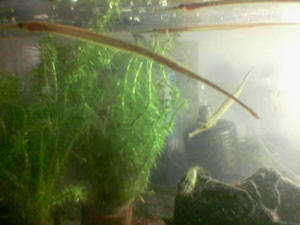 Neale, many years ago I was a pipefish fan, and I kept D. Boaja in my FW aquarium back then. So I know how difficult it is to keep them, especially when enticing them to eat. We did chatted about this in the past, do you remember? With that being said, when I was at my procurer's last week,. one of the fish sellers showed me some interesting Pipefishes. They are different with the ones I used to keep. Could you identify this species? I include the pictures of both the kind which I used to keep, and the one I just found. 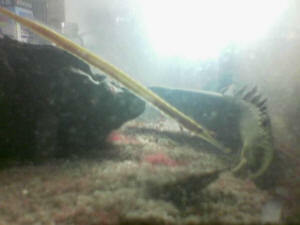 The one I used to keep are bright yellow and have long snout. The one I just found are darker and have short snout. The species I kept hang out at the surface, while this darker species seems to hang out at the bottom. Both species are now being kept in full FW by the seller. But maybe the darker one is one of those brackish water species (if any)? Well, thank you for your time, and have a nice weekend! if trained from fryhood ;) and although I just got some tall spiral shelled snails that look like MTS (hahaha my third species so far; I have some small apples and 2 colors of Ramshorn, but I do so love inverts! ), I want some more snails haha. And my friend who's going to sell me the pipefish also told me she has a freshwater clam to sell. I know feeding's rather complicated, but could I feed the clam on infusoria? Is it wise to get one? I don't mind not seeing it much, as long as it comes out sometimes. Would it uproot my plants (thinking of getting a leafy type ground cover plant)? Will the clam eat the leftover flakes, or crushed shrimp/snail/turtle/frog food? I always make sure some sinks anyway for my Cory cats, and they look fat, sleek and healthy lol! Also assuming it buries itself, how often should I uproot it to see if it's still alive? And, if it does die, is there any sort of scavenger that could dig it out and eat it before it becomes a problem? Thank you sooo much in advance! By the way, my tank is 63G with a 100L sump, bio-balls and the whole thing, and is sparsely (as of yet) planted. I have two angelfish, two swords, one Betta that I am trying to rehome and 3 paleatus Cory cats. now that I can get live food reasonably often. Is there anything I can feed them in terms of 'human' food? Would they like crushed dog/cat kibble as a treat? 1. My Pipefishes get along well with a couple of Polypterus and several Spiny Eels on the same tank. Polypterus does not bother the eels nor the Pipefishes in any way. And their favorite food (shrimp pellets) are not attractive enough for both eels and Pipefish. 2. Spiny Eels prefers frozen worms, and stays buried on the sand most of the times. But at certain hours, they will come out and eat Tubifex worms. Pipefishes chases Daphnia, nibbled at small Tubifex worms (I begin to cut down on that one, I plan to completely remove them as food item one day) and has just began to eat Frozen Shrimps, and they tends to float away near the water plants. Polypteruses tends to "crawl" in the sand, looking for shrimp pellets. So they seems to have their own "territories" in my tank, and thus avoiding conflicts. 3. Pipefishes are individual fish with individual differences. I observed that one of my Pipefish already eating frozen shrimps regularly, but the others do so only rarely and reluctantly. So, I believe the process of adapting them into frozen shrimp is a long one, taking a lot of patience. 4. Pipefishes really loves to eat Daphnia. I dumped 10 bags of Daphnia in their tank, and my Pipefishes finished them off within two days. The Daphnia tends to gather on a corner where algae starts to grow, making them easy pickings for the Pipes. Well, that is what I observed for now. I hope this will be useful for other WetWebMedia visitors who loves Pipefishes. In fact, I'd love to hear from other Pipefishes enthusiasts whom are successful in feeding their fishes with frozen food. Lastly, I thank you Neale for guiding me along the way, you have been most helpful! in particular about how you know the male is carrying eggs or not. I have a couple, I am pretty certain it is a male female pair as they spend all their time together and do not look the same. 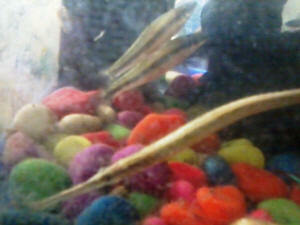 One is slender and a green like colour and the other is greyish with markings along the majority of the fish. The greyish one has a distinct pouch, which seems to me to be open. How do i know if this one is carrying eggs? I can not view it close enough to get a clear view. The pouch is very large down the two sides of the body but concave down the centre. Can you give any information or recommend any books or websites that could help? Thanks in advance for information you could give. My favorite aquarium fish store offered me freshwater Pipefishes. Having read your articles at Wet Web Media (and Mr. Burhans's article), I knew that they're somewhat advanced, but since they're being offered in such low prices, and I have access to live food (my home are very close to a bunch of fish stores) and a spare tank, I decided to get a couple of them. My Pipefishes seemed to adapt well with their new home. The filter are not too strong (no fishes get sucked in) but gets the job done, the aerator works well but does not make strong currents, and I made sure that they're the only surface predator in the tank, which means no tankmates other than a few small river shrimps, and I put very small, newly-hatched fries, as their living meal. The Pipefishes seemed to be stalking the fries, often very close (a picture is included), but I never seen them gulping any of those fries. The Pipefishes are about 9 cm in length, and from the size of their mouths, I am sure they are capable of gulping the fries. Is there any further advice you could give me? My Pipefishes aren't as playful as my Polypteruses, but they're cute fishes too in their own way, and I like them very much. Thank you very much in advance. Thank you for your kind reply. I will switch them to a diet of mosquito larvae, will this do? <Hopefully! 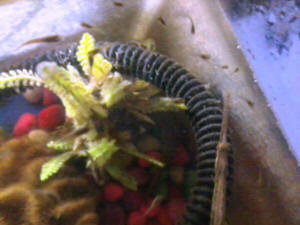 Really, any small pond foods should do, so feel free to visit nearby ponds and trawl with a net and see what you find. If the pond doesn't contain fish, it should be perfectly safe so far as parasites go. <Would use smooth silica sand in preference to gravel, even fine gravel. perhaps I could find a species of small freshwater eels who loves to dig gravels. I hope it will be interesting to watch them play with the rounded gravels. <Be sure the smooth silica sand, in the US often called "pool filter sand". as the fish store guy confirmed that they have it in stock. They said they have Spiny Eels as well (they call it Ikan Sili), and I got a piece of real bogwood as a bonus if I buy a couple of them. So I will pick up the Eels tomorrow. Last evening I have put a few mosquito larvae on the Pipefish's aquarium, as well as a small piece of frozen bloodworm cube. This morning there are no leftovers (or maybe they're hidden in the gravel? ), but I never seen the Pipefish eating, as I gone to bed not long afterwards. There are river shrimps, live fish fries, and about 12 red cherry shrimps within the Pipefish's aquarium, so I am not sure who ate the worms and the larvae. The Pipefish looks fine though. How can I differentiate between hungry Pipefishes and normal Pipefishes? How long could Pipefish survived without food? I read somewhere in the Web that they won't last more than 3 days if not feeding properly, is this true? 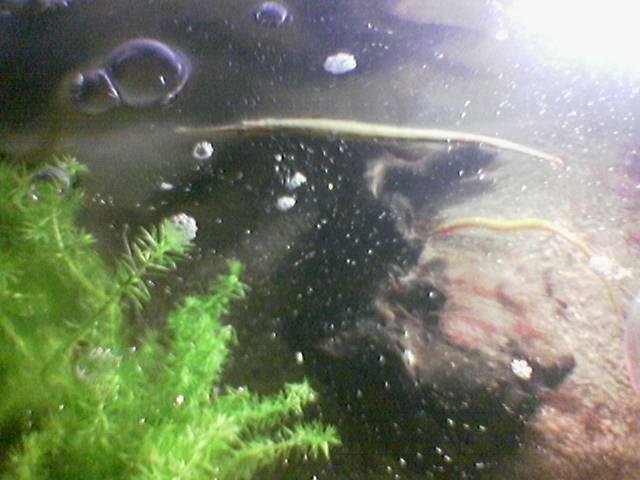 Just want to tell you the good news, I finally see my Pipefish ate a larva and a very small live Tubifex worm. The way they eats is unusual. I saw a larva fell to the bottom of the aquarium. The Pipefish turned its position so its tail is on top and its head is downwards, then aimed its mouth to between the gravels, where the larva and a few worm hides, then it seems to be "sucking" both the larva and a very small worm. That was the first time I saw a Pipefish ate something! A guy in the fish store suggested live Tubifex worms instead of frozen bloodworms (which my river shrimp love, but I never seen my Pipefish ate them), and so I tried the idea, seemed to work! 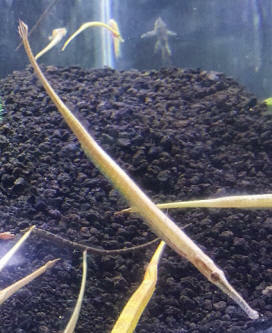 Anyway, I include the picture of my Pipefish. Could you tell what species it is and whether it's really a Freshwater type (as the local fish guy insist)? Also, what are the two fishes swimming close to my Pipefish? I bought them because the fish guy's persuasion.. he said they're cheap, they will eat aquarium algae, and they won't bother my pipefish. What are your thoughts about them? On a lighter note, I removed all cherry shrimps from the Pipefish tank (leaving only one large river shrimp) because they're too small and red-ish, I cannot see them very well hiding in the gravel, and what's the point of having shrimps which I cannot see? Again, thank you very much for your kind attention and advice! You are ever a fantastic source of advice, but I'm at a loss on this one. 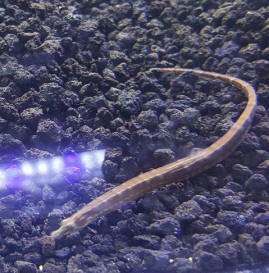 An aquatic store a few miles away from me has Doryichthys martensii in stock, a freshwater pipefish. I have always loved seahorses and pipefish, but have not managed to get as far as a marine tank. I consulted my book on seahorses and pipefish and these do appear to be 'freshwater'. Are they really? Or are they actually brackish? I decided because they were in stock further away, I would contact my LFS to see if they could get them as they must be on wholesaler lists and I trust my LFS. However, my LFS say they don't like to order them in as so many fatalities occur in transit. They would rather people did not buy them. <Understandable. These fish do ship fairly poorly, though some of that is to do with brackish water species being processed as freshwater species. Could you perhaps enlighten me a little on this, as one of my reasons for avoiding marine has been because of the high mortality rate and I don't want to contribute - I'm too scared to take that next step, despite having been fishkeeping for twelve years! But with this said, their track record in home aquaria is fairly dismal. The final problem is I do not have a completely empty tank; I have a twenty gallon long with some freshwater gobies of the Stiphodon genus. Would I be better to wait until I negotiate another tank (been on this for sixth months and he isn't giving in- yet!) with my partner, or should I steer clear of pipefish full stop? Please help me clear my head; I love pipefish and don't want to be reckless - can't find much about martensii either to be honest, and my pipefish book is very brief - more of an ID book. I was referred to Bob Fenner because I am looking for freshwater pipefish. I am having a hard time finding them and I was hoping you could give me some guidance on who may sell them. I live in New York, so I guess the place would have to be in N. America. Re: Brackish water pipefish Okay, Wrestling Halfbeaks are also an option. They're pretty cheap around here, and they're pretty cool. I've been thinking about getting some anyway. Any tips on breeding them? <See here: http://wetwebmedia.com/ca/volume_4/V4I1/halfbeaks/Halfbeaks.htm http://homepage.mac.com/nmonks/aquaria/halfbeakbreeding.html > I like flatfish, and can get Hogchoakers (under the name of "freshwater flounder"), but I have trouble keeping them alive (the longest I've had one live was about five months, and that was by feeding it a steady diet of freshwater scuds, Cyclops, aquatic sowbugs, etc). Any tips on keeping these amazing fish alive? <Most people forget their nocturnal carnivores, and none of the common species last long in freshwater. There *are* freshwater flatfish, but they're not traded much. The Hogchoker is really a estuary fish that happens to move into freshwater some of the time. But in marine/brackish conditions it will prosper. It's also a *subtropical* fish and will burn out if kept at tropical temperatures. In any case, some details on these fish can be found here: http://wetwebmedia.com/FWSubWebIndex/fwflatties.htm > What kind of plants would be suitable in a brackish tank with the specific gravity 1.005-1.010? <Not many. Stick with plastic, to be honest. Gives you more scope for moving the salinity up or down as required. There *are* freshwater fishes that tolerate quite high salinities though -- Cryptocoryne ciliata, Java fern, Samolus valerandi, and a few others; see here: http://wetwebmedia.com/BrackishSubWebIndex/brpltsnealeart.htm > As far as "Leonensis bambere" goes, I know that is an incorrect name, however, I was hoping you would be familiar with that name and give me the correct scientific name (I to did a google search and all I could find was info on electric catfish and other unrelated subjects). <Doesn't sound right at all. "Leonensis" is a species rather than genus name -- it means "from (Sierra) Leone" in Latin. So you'd actually get something in front, like Malapterurus leonensis, which would mean the "electric catfish from Leone". Anyway, can't help.> Thanks, Brandon <Cheers, Neale. Sea pipes brackish to fresh water far north Queensland I have found a species of sea pipe in a local river, I am trying to identify, can you help me? It has a length of 12cm a darker brown colour with a off yellow lateral line, no banding or spots, and if unknown species can you tell me how to name it. <The best reference here is Kuiter's: http://seachallengers.com/index.cfm?catID=1&itemID=209 or you can wade through the materials posted on fishbase.org, by calling up the region, re-sorting by family (Syngnathidae) and then going through the species listed (by clicking on them). From there, if they have no pix, you can select (by species), "Google Images", or look on the broader Net through your search engines for more info. by species. Bob Fenner> From your friendly fish friend Steve.